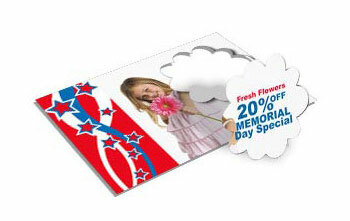 Flower die cut postcards are a fabulous way to promote your business any day of the year. These 4” x 6” inch cards come with a pop out die cut in the shape of a flower. The pop out can be used as a coupon, entry ticket, gift tag, or put to other creative uses. The cards are printed on 14pt ultra-thick cardstock that makes for a durable coupon mailer. Flower cards can be used to promote holiday events, for seasonal marketing, or as an “anytime” promotion. We offer quick turnaround times on printing, making it easy for you to put together your mailing on a tight deadline. Getting ready for a promotional or holiday event? Use these cute flower die cut postcards to communicate your event plans to your customer. You can use these 4” x 6” cards as a coupon mailer by placing a discount or other type of coupon on the die cut pop out. Look in our template gallery for examples of where to place your coupon. If you see a design you like, go ahead and customize it in our online design center and use it yourself. The designs are free! Although the die cut design can be used for coupons, it can be used in other ways, too. If your business isn’t the type that offers discounts, consider using the die cut for a personal greeting in your own handwriting. Adding a personal touch to communications with your customers always brings a better response. Flower Die Cut Postcards is rated 5.0 out of 5 by 1. Rated 5 out of 5 by lucy from SUPER GREAT The flower shape was perfect, just what we needed. Quality is fantastic, matte finish is nice. Delivered quickly!